Though it looks like this cedar cabin is floating above the terrain, the structure actually sits atop nine steel stilts. 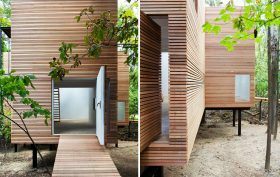 Architect Steven Holl employed the building technique to minimize the home’s impact on the forested environment and likewise wrapped the construction in a cedar skin so it would meld with the trees. Known as “T Space,” the minimalist art gallery is located on a privately-owned, four-acre woodland property in Dutchess County.